Grilled Chicken roll or Ayam Gulung Dadar in Indonesian is the excellent choice for your evening dinner. You can make it early in the morning or the day before and finish it before the dinner time. This oriental recipe is very suitable for the whole family. And most of the children like chicken. This chicken breast recipe can be eaten in combination with grilled potatoes and vegetables or with warm rice and sambal. It doesn't really matter. The both combination is evenly delicious. Make a smooth paste of garlic, shallots, candlenuts, galangal, coriander and cumin powder. Set aside. Chopped chicken filet or chicken breast until you get very small pieces. Pour some lemon juice over this. 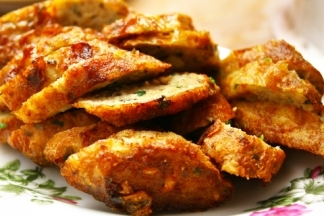 Mix this chicken filet with wheat flour, bread crumbs, eggs, and the smooth paste. Add coconut milk, chopped celery, salt, sugar and tamarind water. Mix well and set aside. Meanwhile make the sheets from eggs. The sizes is about 8 inch. Take 2 sheet of eggs, spread half of the mixture, and roll them. And do some bake paper over this, and make sure that the end is close. Take another 2 sheets, and make the same roll again for the other half of the mixture. Make the roll open, and put them into baking plate and bake them in the oven with 175 degree celcius for about 30 minutes. Cut into thick slices about 1 inch. If you prefer to make a fried chicken roll instead bake them in the oven, cut the roll first and then baked them in the hot oil. But it contains more fat than if you grilled them. It depends on your taste.